Pectoralis major muscle is a superficially placed, large fan-shaped muscle on each side of sternum in the anterior chest wall. Immediately deep to it, a thin, triangular muscle, the pectoralis minor takes origin from upper margins and outer surfaces of the third-to-fifth ribs (frequently 2nd–4th) near their costal cartilages and is inserted on the coracoid process of scapula. These muscles help in attaching pectoral girdle to the anterior chest wall. Lateral edge of the pectoralis major muscle forms the anterior axillary fold. Pectoralis major and minor both form anterior wall of axilla. The presence of additional muscle is generally uncommon. In the present study, the accessory slips were seen deep to pectoralis major flushing with origin of pectoralis minor. A variation was observed in a routine cadaveric dissection of a pectoral region on a formalin-fixed male cadaver. Deep to pectoralis major, the pectoralis minor muscle was seen arising from second-to-fourth ribs near costochondral junction on both sides. In addition to that on the left side, a triangular muscle was arising with three muscular slips from outer surface of third-to-fifth ribs near costochondral junctions and from the lateral end of fifth costal cartilage. The fibers were directed superolaterally, overlapping the lower part of pectoralis minor muscle, and continued with the fibers of lower part of the pectoralis major muscle toward its insertion [Figure 1]. On the right side, a similar solitary slip was seen originating from the outer surface of fifth rib near its costochondral junction and lateral end of fifth costal cartilage. Its fibers were passing superolaterally without overlapping lower part of pectoralis minor muscle and were continuous with pectoralis major similar to its left counterpart [Figure 2]. This supernumerary muscle was observed to be getting its innervations from medial and lateral pectoral nerves. A vascular pedicle from the pectoral branch of thoracoacromial axis which was supplying pectoralis major was giving branches to the supernumerary muscle along with branches of lateral thoracic artery. The fibers of the supernumerary muscle, in the present case, are seen to be merging with the pectoralis major before it got inserted into the humerus which might be rare as many cases in the literature mostly mention about insertion of supernumerary muscle in the shoulder region or coracoid process or coracobrachialis fascia. In the beginning of last century, i.e., in 1902, Huntington described and discussed the findings of supernumerary muscles in the pectoral region by different researchers. Hardy and Fabrizio showed that the presence of accessory pectoral muscle and pectoralis quadratus on the left side, both inserted into coracobrachialis fascia. There is also mention of pectoralis tertius and pectoralis minimus muscle in the literature. Bannur et al. reported that an accessory pectoral muscle on the right side which fused with pectoralis minor at its termination. Patil et al. reported that unilateral accessory pectoralis minor between major and minor, which fused with the deep surface of pectoralis major. Terfera et al. noted that a bilateral aberrant muscle slip associated with pectoralis minor muscle. Wehrli et al. described that an accessory pectoral muscle (musculus infraclavicularis) arising from clavicle and getting inserted on deltoid fascia. Such variations are common due to the peculiar development of pectoralis major and minor muscles in the early embryonic life. In the early stage of development (9-mm embryo), a pectoral muscle mass (from which both pectoralis major and minor arise) lies in the lower cervical region on the medial side of the arm bud and lies anterior to the first rib. In an 11-mm embryo, it reaches up to the third rib. Till this time, it is seen as a single muscle mass attached to humerus, coracoid process, and clavicle. In further development, the muscle mass flattens and extends caudoventrally. In a 14-mm embryo, the caudal end reaches up to the fifth rib and then the proximal part of the muscle mass splits into major and minor portions – the one attached to the humerus and the other attached to the coracoid process, respectively; however, both muscles are still fused at the costal attachment. In a 16-mm embryo, they acquire their adult form and both muscles now show their distinct attachments. In the present case, the fibers of the supernumerary pectoral muscles seem to be part of the pectoralis major, which probably failed to migrate along with it. Such multiple variations in pectoral muscles can lead to difficulty in classification and location of metastatic lymph nodes in malignancy. This can be a valid debatable point for oncosurgeons and radiologists. Regarding axillary staging of breast cancer, Ecanow et al. have highlighted the importance of being familiar with axillary anatomy and few existing landmarks (e.g., pectoralis minor muscle), both to be able to thoroughly examine the axilla with ultrasonography as well as to accurately identify the location of abnormal lymph nodes with any cross-sectional imaging modality. Surgeons and radiologists divide the axilla into three levels by the pectoralis minor muscle. There are five groups of lymph nodes in the axilla: three groups in level I, which is inferolateral to the pectoralis minor; one group in level II behind the pectoralis minor; and one group superomedial to the pectoralis minor in level III. Supernumerary muscles may change the configuration of anatomy in the axilla. Del Sol and Vasquez also say that supernumerary fascicles of the pectoralis major muscle according to its relation to the axillary walls and contents may constitute difficulty in the access of the area. In anterior chest wall reconstruction, the pectoralis flap is most commonly used. Varied anatomy of pectoralis major should be taken into consideration before such surgeries. Supernumerary pectoral muscles cannot be ignored while considering clinical scenarios in the pectoral region, such as – insertion of these muscles on different sites may have their own implications especially if they are compressing any neurovascular structures or if are related with shoulder joint structures. Understanding of variations in pectoral region helps to explain possible variations in the axilla which will help to make a better radiological diagnosis and plan of surgery in the region. During reconstructive surgeries in the anterior chest wall consideration of variations of pectoral muscles and their configurations is highly significant. Hence, the pectoral muscles are important muscles in the anterior chest wall, and they have a key role in the axillary region, and hence, the supernumerary pectoral muscles should be taken into consideration especially during imaging and surgical procedures. Standring S, editor. Gray's Anatomy: Pectoral Girdle and Upper Limb. 40th ed., Sec. 6. New York: Elsevier/Churchill Livingstone; 2010. p. 807-8. Huntington GS. 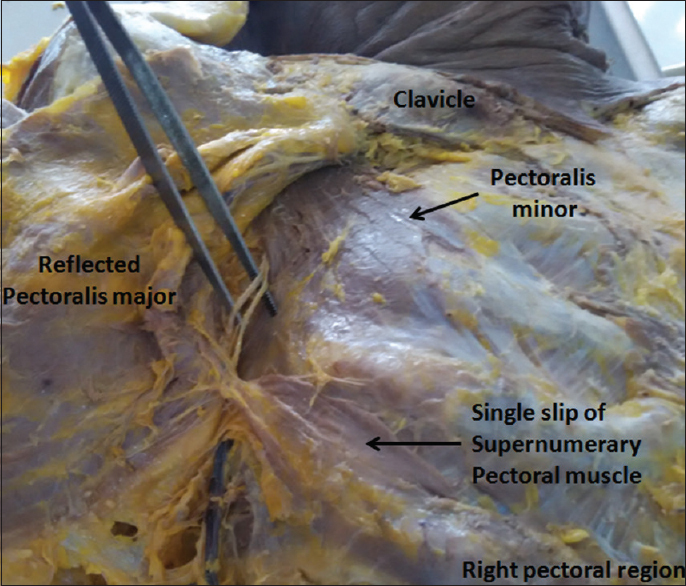 The derivation and significance of certain supernumerary muscles of the pectoral region. J Anat Physiol 1904;39:1-54.27. Hardy MA, Fabrizio PA. An accessory muscle of the thoracic wall. Int J Anat Var 2009;2:93-5. Del Sol M, Vasquez B. Anatomical and clinical considerations of the pectoralis tertius muscle in man. Int J Morphol 2009;27:715-8. Rai R, Ranade AV, Prabhu LV, Prakash, Rajanigandha V, Nayak SR. 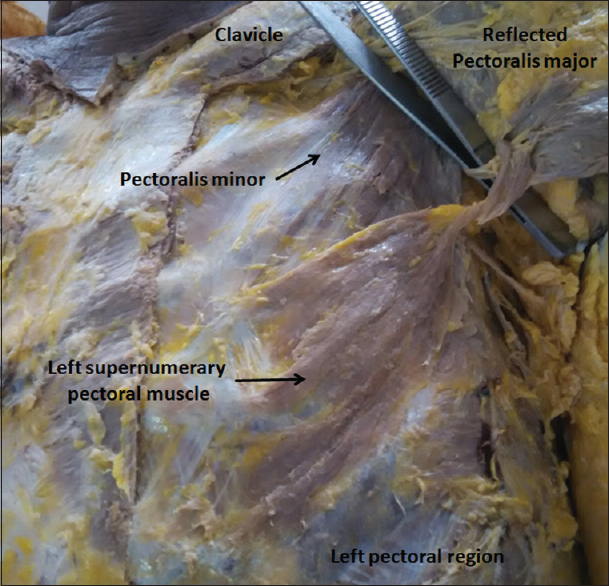 Unilateral pectoralis minimus muscle: A case report. Int J Morphol 2008;26:27-9. Bannur BM, Mallashetty N, Endigeri P. An accessory muscle of pectoral region: A case report. J Clin Diagn Res 2013;7:1994-5. Patil J, Kumar N, Swamy RS, Somayaji SN, Nayak SB, Mohandas Rao KG. Accessory pectoralis muscle intervening between pectoralis major and minor muscles – A case report. Int J Health Sci Res 2014;4:198-201. Terfera DR, Alder A, Kelliher KA. Bilateral pectoralis minor muscle variant. Int J Anat Res 2015;3:941-4. Wehrli F, Bergmann M, Nyffeler RW. Bilateral musculus infraclavicularis. Glob J Arch Anthropol 2017;1:555572. Lewis WH. The development of the muscular system. In: Keibel F, Mall FP, editors. Manual of Human Embryology. Philadelphia: I. J. B. Lippincott Company; 1910. p. 1-27. Ecanow JS, Abe H, Newstead GM, Ecanow DB, Jeske JM. Axillary staging of breast cancer: What the radiologist should know. Radiographics 2013;33:1589-612. Rubacha M. Breast. In: Shane Tubbs R, Shoja MM, Loukas M, editors. Bergman's Comprehensive Encyclopedia of Human Anatomic Variation. John Wiley and Sons Hoboken, New Jersey; 2016. p. 1390-1. Bakri K, Mardini S, Evans KK, Carlsen BT, Arnold PG. Workhorse flaps in chest wall reconstruction: The pectoralis major, latissimus dorsi, and rectus abdominis flaps. Semin Plast Surg 2011;25:43-54. Creager MA, Dzau VJ. Vascular diseases of the extremities. In: Kasper DL, Braunwald E, Fauci AS, Hausar SL, Longo DL, Jameson JL, editors. Harrison's Principles of Internal Medicine. USA: McGraw-Hill Companies; 2005. p. 1489.